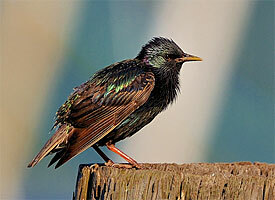 Starlings create problems by nesting on or inside buildings and wall cavities. 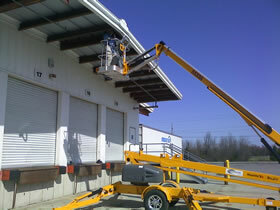 They utilize a multitude of roosting sites, including building ledges, lighted signs, marquees, billboard bracing, hollow lamp posts, and soffits, as well as dryer and stove vents. They are very loud at roosting time and leave nothing but filth. These birds also can have chicken mites in their nests which can infest the home or building they are nesting in. 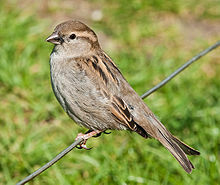 These birds can be eliminated by exclusion work, removal of nest, exclusion products and repairing. Baiting can also be performed as a last resort. 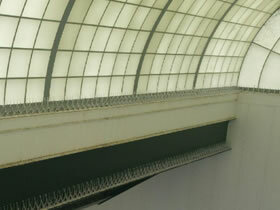 Pigeon Exclusion Work being performed by a Certified Technician. Local stadium outfitted with 7" spikes to prevent birds from perching. 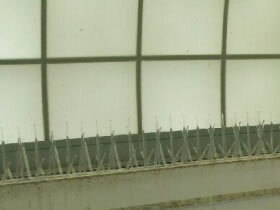 Close-up view of the bird exclusion techniques used at local Stadium.